As our regular readers know, we frequently pose a series of questions to a winemaker to probe their winemaking philosophy and to gain insight into how they became a winemaker. This week, we are featuring Roman Roth, the winemaker at Wölffer Estate in Long Island, NY. Founded by Christian Wölffer in 1987, Wölffer Estate is run today by his children, Joey and Marc Wölffer, along with Roman. Roman’s path to winemaking is perhaps the most to be envied. Roman was born into a winemaking family in Germany, so, as he explains, his childhood was accompanied by great wine that was celebrated and revered. At age 16, Roman began an apprenticeship in winemaking in Germany. After more experience in the United States and Australia, and after finishing an oenology degree, he took his current position as winemaker. I was born and raised in Rottweil, Germany, at the edge of the Black Forest. My father was a cooper and a winemaker, and when barrel-making became unfashionable in Germany, he and my mother started a wine merchant business together. So great wine was always celebrated and highly revered in my family. In 1982 I was 16 years old and started my 3-year winemaker apprenticeship at the Kaiserstühler Winzerverein in Oberrotweil, Germany. In 1986 I traveled to the USA for the first time and worked at Saintsbury in Carneros. In 1988 I worked two harvests onopposite sides of the world: first at the Rosemount Estate in Australia, which really opened my eyes, then I went back to Germany and worked another harvest at the Winzerkeller Wiesloch Winery in the Heidelberg region. 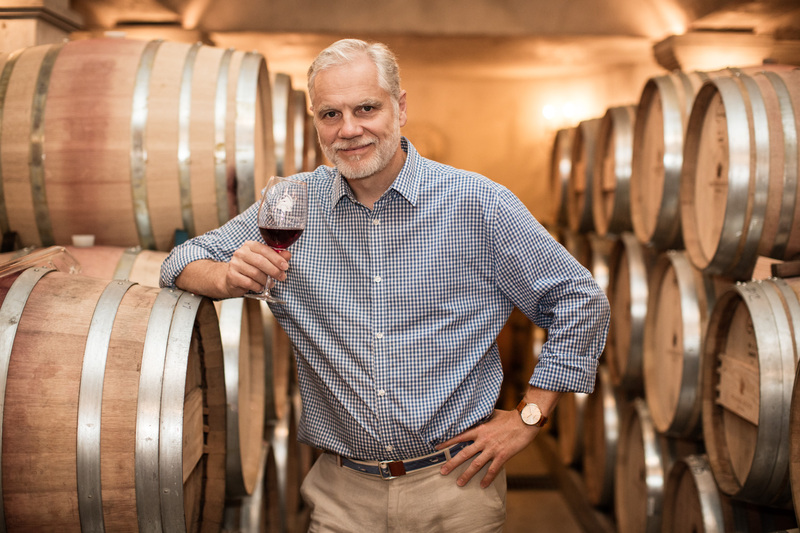 In 1992 I finished my Masters Degree in Oenology in Weinsberg and accepted an offer from Christian Wölffer to become the first winemaker at Wölffer Estate (then called Sag Pond Vineyard) in the Hamptons of Long Island, NY. There are a number of reasons why Wölffer Estate Vineyards are special. First, Bridgehampton has great soil with up to 8 feet of clay and a layer of loam and silt sit on top of sand, which provides great drainage. Secondly, the island’s maritime location results in milder winters: no spring frosts and cooler winters. Long Island is also the last area in New York to get a frost in the fall, which produces wines of lower alcohol, yet great concentration. It also sits on the same latitude as Madrid, Spain, and Naples, Italy (lots of sun!). Lastly, the team at Wölffer Estate Vineyards is dedicated and full of pride. Our fantastic vineyard team led by Richard Pisacano, and staff and management team lead by GM Max Rohn, are extremely talented and detailed oriented. Our owners, siblings Marc and Joey Wölffer, are proud and involved, they don’t cut corners, and they are willing to invest in quality in order to fulfill their vision. First: to make food-friendly wines with balance, elegance, good structure, and nice acidity. Second: to craft wines with longevity and with layers and concentration to withstand 20, 30 or 40 years of bottle aging. Third: to make wines that are authentic and capture our sea breeze and are fruit-driven, yet have our traditional Wölffer style. Finding the perfect moment to pick the fruit. Not too early and not overripe. Balance is key to great wines and capturing it is always a race against time at harvest. There are many: Gunter Künstler from the Rheingau, Philp Shaw from Australia, Bob Carthwright, former winemaker at Leeuwin Estate in Western Australia, and Paul Pontallier of Chateau Margaux just to name a few. I am excited about young winemakers who are starting to make a difference in hot climate regions with a more moderate style. One example is Gustavo Bertagna at Dominia del Plata in Argentina. That is a tough question. I would say: Champagne, Piedmont, and Rheingau. I was fortunate to taste a vertical of 57 vintages of Pétrus – the 1947 was a stunning wine and one of the most amazing I have ever had. The 1988 Krug is also amazing. The amount of acidity and concentration is fantastic. I have 8 or 9 bottles from 1966 (my birth year): 2 or 3 German Rieslings, 4 Burgundy Pinot Noirs, and 2 Bordeaux. I have one bottle left of the 1988 Krug. I just finished making the wine list for our 2 restaurants: Wölffer Kitchen in Sag Harbor and Amagansett. At the Amagansett Restaurant the theme is East Coast vs West coast. So I have a wonderful Appoloni Vineyard 2014 Pinot Noir from Oregon open, and for Sag Harbor I added a high end list this year and one of the wines was the Comte Lafond Grand Cuvée Sancerre Blanc 2014 from the Loire. And of course there is always a bottle from Wölffer Estate open. The Wölffer Estate Perle 2015 Chardonnay – this is one of my favorite wines that I never get tired of. The Grapes of Roth By Wölffer Estate 2013 Merlot – this was a dream vintage and it is a fantastic red. It takes many a good beer to make a great wine! A hot day and a good beer is certainly a welcome combination every now and then. I like to go to the Met Opera in NYC, I play golf, do a lot of gardening, cook a lot and spend time with my wife and daughter. younger) cellar crew (when I’m not injured!). I would be a tea planter in Sri Lanka, a stained glass window artist, or a pastry chef. Being happy, healthy, and looking forward to and enjoying work every day.